Container Store announced their “NAME YOUR SALE”-sale via their POP! program where members received a unique promotion code good for 20% off any single item. Just hand over the promo code and they’ll take 20% off the highest-priced item in your cart. Of course this has all the normal exclusions: tax, shipping, delivery, installation and gift cards. At least this Container Store sale offers a legitimate discount and doesn’t require a minimum spend a la Nespresso’s non-National Coffee Day sale which forced their loyal customers to spend a minimum of $70 before getting a measly 10% off. 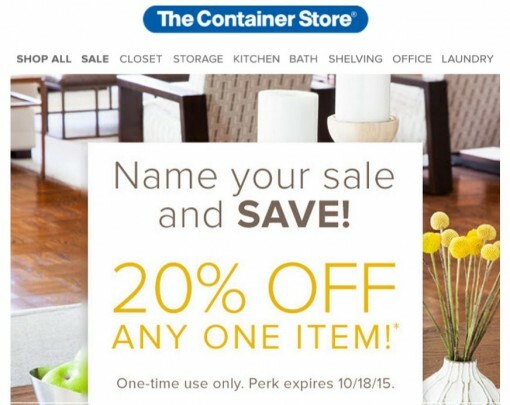 The Container Store promotional code is good for online, in-store or by phone. The promo code expires 10/18/2015.